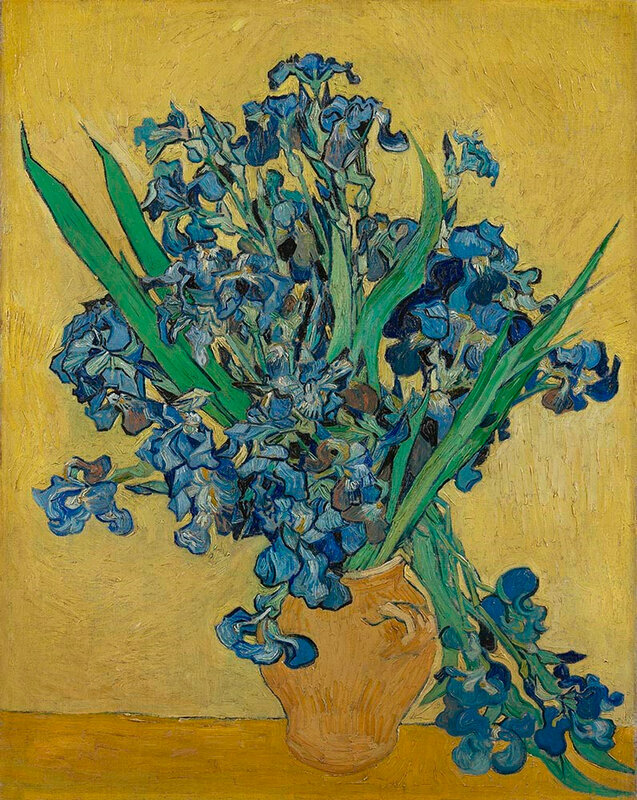 Vincent van Gogh, Irises, May 1890, oil on canvas, Van Gogh Museum, Amsterdam (Vincent van Gogh Foundation). HOUSTON, TX.- Few artists have left behind as complete an account of their life and work as Vincent van Gogh (1853–1890). The Museum of Fine Arts, Houston, presents Vincent van Gogh: His Life in Art, an exhibition showcasing key passages in the artist’s life, from his early sketches to his final paintings, and chronicling his pursuit of becoming an artist. The Museum is the only venue for His Life in Art, presenting more than 50 portraits, landscapes, and still lifes. The exhibition is on view at the Museum of Fine Arts, Houston (MFAH), from March 10 to June 27, 2019. Vincent van Gogh, Self-Portrait, 1887, oil on cardboard, Van Gogh Museum, Amsterdam (Vincent van Gogh Foundation). The exhibition explores Vincent van Gogh’s early years as an artist in the Dutch village of Nuenen from 1883 to 1885; his renewed inspiration following exposure to fellow artists and city life in Paris; his further development in Arles, where he created series of landscapes and vibrant portraits; and lastly his inspiration from nature, reflected in the paintings he created toward the end of his life in Saint-Rémy and Auvers. In addition, facsimiles of Van Gogh’s letters build out the narrative of the artist’s life. Incorporated throughout the exhibition, they trace his hopes of becoming a marketable painter in Paris, his longing to live among a community of artists, and his struggles with his personal relationships and his mental health. Vincent van Gogh, Portrait of a Peasant Girl in a Straw Hat, 1890, oil on canvas, Private Collection. Vincent van Gogh became an artist at 27, taking up painting in 1881 after stints as an art dealer, teacher, bookseller, and minister, all unsuccessful. 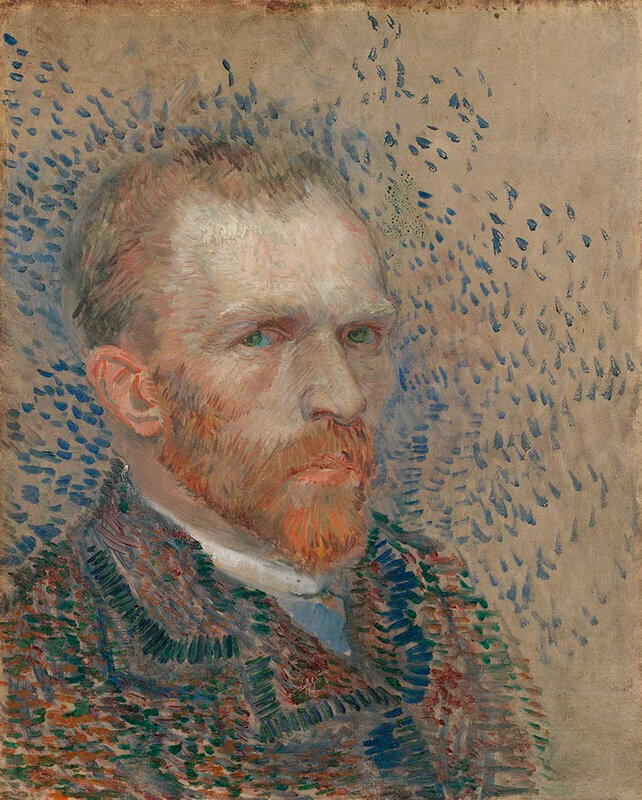 His brother, Theo, encouraged him to concentrate on drawing, spurring Van Gogh to work on his technique and connect with other artists. He was largely self-taught, and his early work reflects an engagement with Realism and an interest in conveying both the physical and psychological conditions of his subjects. 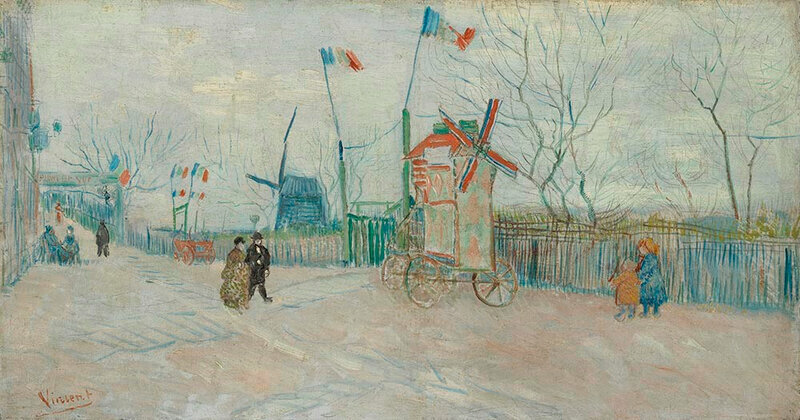 Van Gogh sent his work to Theo in exchange for the financial support his brother offered. “I’m sending you three scratches that are still awkward, but from which I hope you’ll nonetheless see that there’s gradual improvement. You must remember that I haven’t been drawing for long, even if I did sometimes make little sketches as a boy,” Van Gogh wrote in a letter to his brother on April 2, 1881. His development as a painter continued, as he produced farm scenes in the village of Nuenen following in the footsteps of admired artists such as Jean-François Millet. He studied and recorded every facet of rural life, realistically portraying with the harsh circumstances of farm laborers rather than idealizing them. During this time, Van Gogh’s character studies culminated in portrayals of rural life. Three of Van Gogh’s studies for The Potato Eaters (1885), his first major painting and one of his best-known, is on view, alongside sketches of the day-to-day life of villagers. Van Gogh’s works from his time in Nuenen also feature an old church tower, which he painted as a tribute to those who had been laid to rest among the fields they had planted. 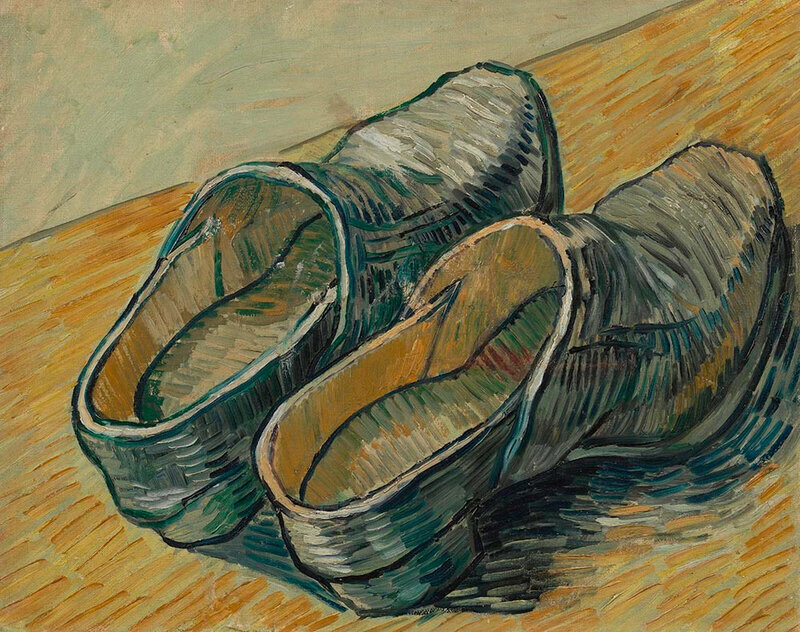 Vincent van Gogh, A Pair of Leather Clogs, autumn 1889, oil on canvas, Van Gogh Museum, Amsterdam (Vincent van Gogh Foundation). From Nuenen, Van Gogh left for Antwerp to enroll in an art academy and take drawing classes in November 1885. Abandoning the theme of rural farm life, he shifted his focus to portraiture. Shortly following, he left for Paris where he moved in with Theo. The city inspired a brighter palette, while his friendships with Emile Bernard and Henri de Toulouse-Lautrec had a major influence on his work. Featured in this section is a portrait of Agostina Segatori, the owner of Café du Tambourin, a gathering spot for Parisian artists that Van Gogh frequented. While in Paris, he discovered a new source of inspiration in Japanese woodcuts, which he had begun to collect. 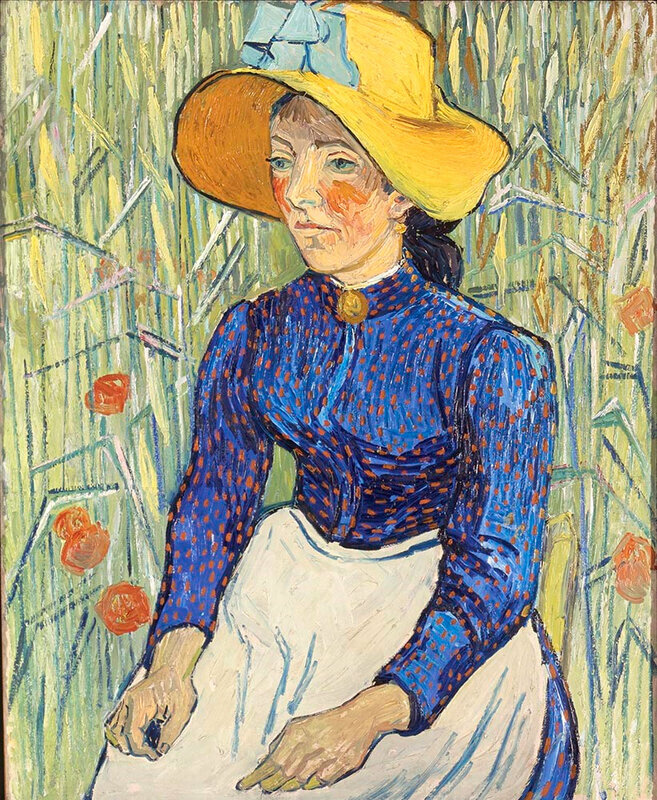 Their influence is reflected in the bold outlines, dramatic cropping, and color contrasts of Van Gogh’s work. Vincent van Gogh, Impasse des deux frères, 1887, oil on canvas, Van Gogh Museum, Amsterdam (Vincent van Gogh Foundation). After two years in Paris, Van Gogh grew weary of city life and longed for a setting like those in the Japanese landscapes he admired. He hoped to find it in the south of France, and relocated to Arles. “I noticed some magnificent plots of red earth planted with vines, with mountains in the background of the most delicate lilac. And the landscape under the snow with the white peaks against a sky as bright as the snow was just like the winter landscapes the Japanese did,” he wrote to Theo on February 21, 1888. With this return to the countryside, Van Gogh developed a recognizable style of his own, characterized by long, rhythmic brushstrokes and thick layers of paint in increasingly brighter colors. Inspired by the bright light and the colors of southern France, he painted fields of wheat, vineyards, and vibrant portraits. But months of personal crisis followed. Still Life with a Plate of Onions (1889) was one of the first paintings Van Gogh completed after returning home from the hospital where he was treated after slicing off his ear. On that day, January 17, 1889, he wrote to his brother Theo that he intended to begin working to get used to painting again and had already done a few studies. But Van Gogh’s mental health continued to fluctuate. He admitted himself to Saint-Paul-de-Mausole psychiatric asylum in Saint-Rémy in May 1889. 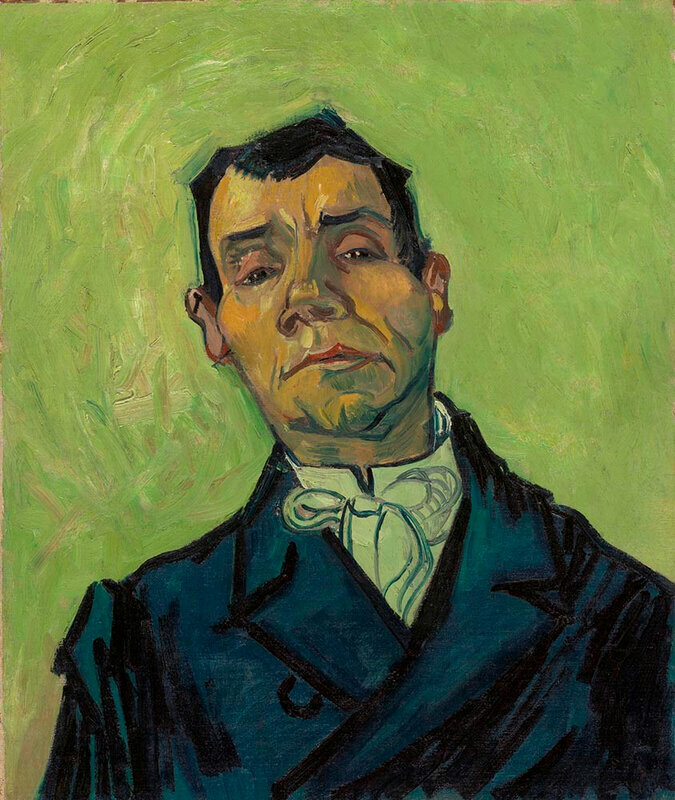 Vincent van Gogh, Portrait of a Man, end of October–mid-December 1888, oil on canvas, Kröller-Müller Museum, Otterlo, the Netherlands. © Kröller-Müller Museum. At the asylum in Saint-Rémy, Van Gogh created dozens of paintings of the gardens of the institution, the fields outside his window, and of the few possessions that he had in his room. During this period, in which he produced some of his most iconic masterworks, including Starry Night and Irises, he also ventured into the wheat fields and olive groves. In his studio, he made a series of paintings after prints, resulting in such idyllic scenes as Peasant Woman Binding Wheat Sheaves (1889), once again inspired by the work of Millet. In May of 1890, Van Gogh left Saint-Rémy for Auvers, seeking out the care of the doctor Paul Gachet at the suggestion of painter Camille Pissarro. Van Gogh spent his last weeks painting landscape after landscape, including Ears of Wheat in June 1890, one of the latest of his works in the MFAH exhibition. He died from suicide on July 27 of that year. 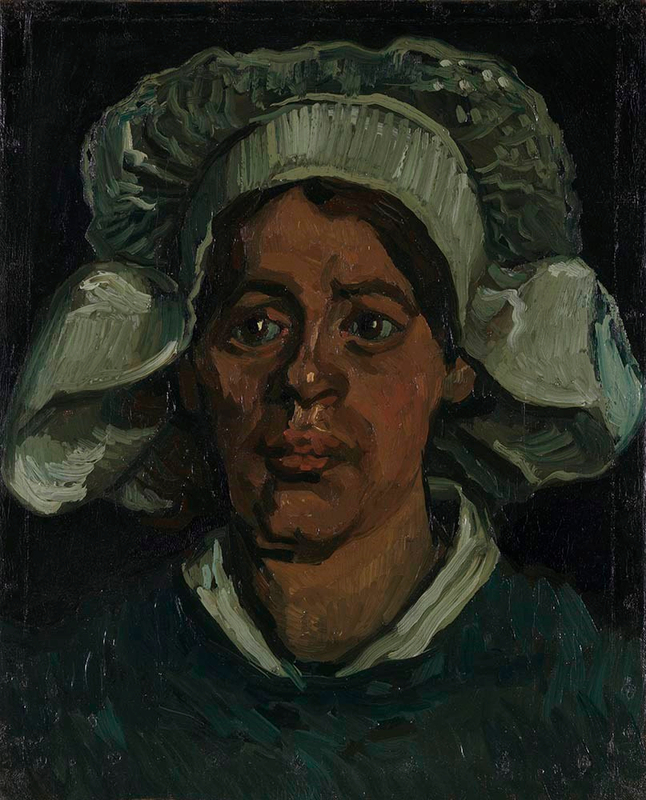 Vincent van Gogh, Head of a Woman Wearing a White Cap, November 1884–May 1885, oil on canvas, Kröller-Müller Museum, Otterlo, the Netherlands. © Kröller-Müller Museum / photo: Rik Klein Gotink. 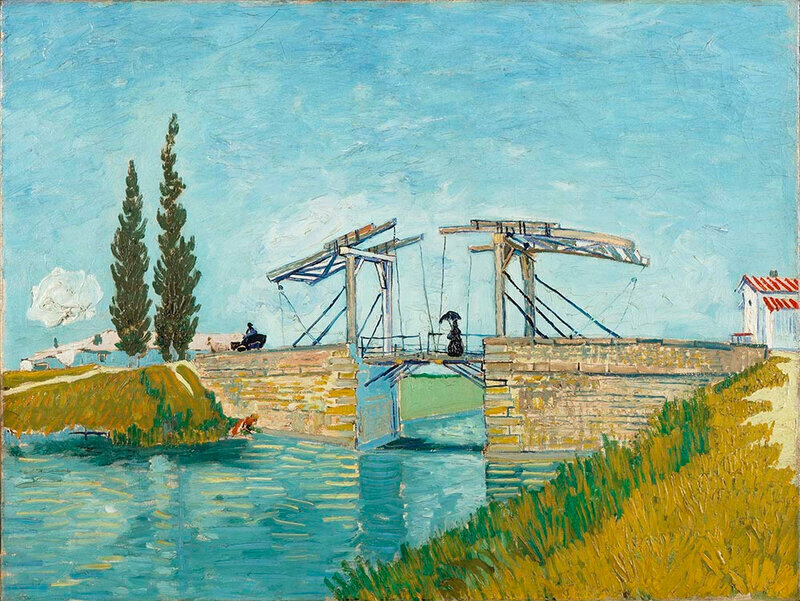 Vincent van Gogh, The Langlois Bridge at Arles, May 1888, oil on canvas, Wallraf-Richartz Museum & Fondation Corboud, Cologne. 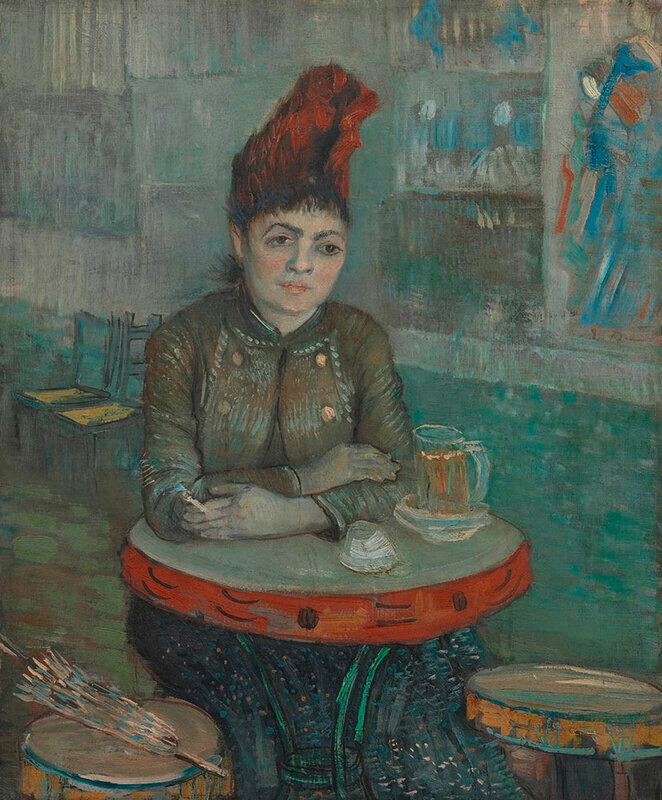 Vincent van Gogh, In the Café: Agostina Segatori in Le Tambourin, January–March 1887, oil on canvas, Van Gogh Museum, Amsterdam (Vincent van Gogh Foundation). 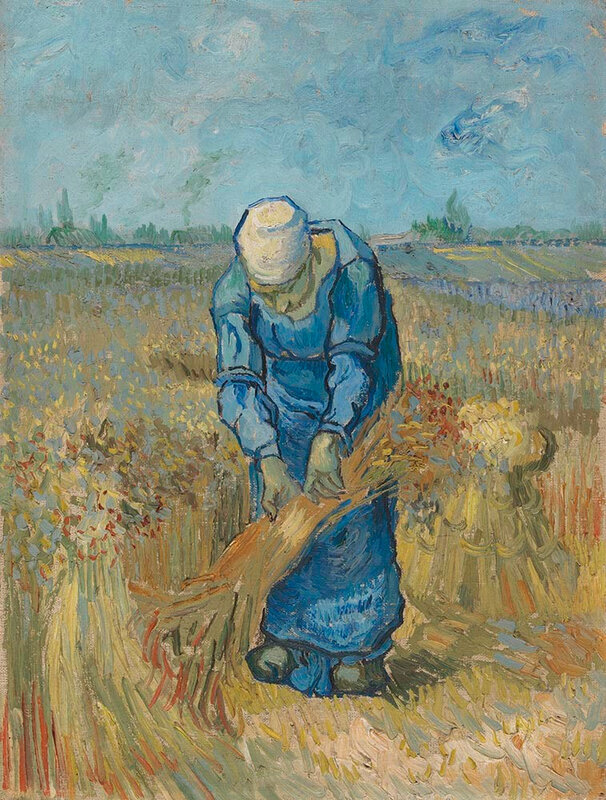 Vincent van Gogh, Peasant Woman Binding Sheaves (after Millet), September 1889, oil on canvas on cardboard, Van Gogh Museum, Amsterdam (Vincent van Gogh Foundation).